May 8 is the 70th anniversary of the end of World War II in Europe. Although Americans and Germans were adversaries in that war, during the Cold War they became allies; today, they remain close strategic partners in NATO and have formed deep trade and investment ties. But a new Pew Research Center survey, conducted in association with the Bertelsmann Foundation, finds the relationship facing new challenges: shared beliefs that their countries should concentrate on their own problems rather than problems abroad; differences over Germany’s future military burden sharing; and disagreements on an EU-U.S. trade deal. 1World War II and the Holocaust loom large for Americans, less so for Germans. 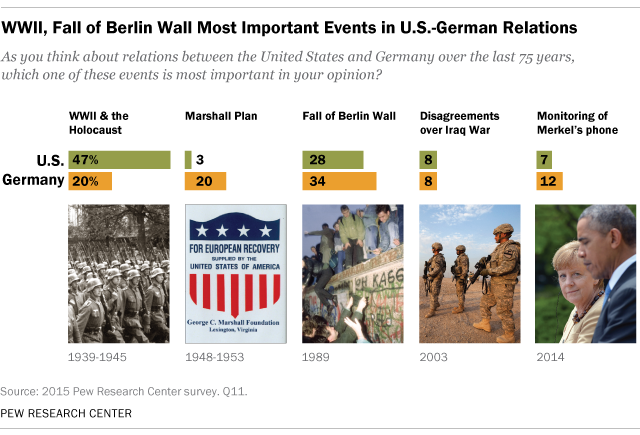 More than four-in-ten Americans (47%) say those events are the most important in the recent history to the U.S.-German relationship. Contrary to what might be expected, younger Americans, those ages 18 to 29 (51%) – not Americans ages 65 and older (40%) – are most likely to cite the war and the Holocaust as the memory that first comes to mind when they think of the U.S. and Germany. Moreover, Republicans (56%) much more than Democrats (39%) mention WWII and the Holocaust. For Germans, the most important event in bilateral relations over the past 75 years has been the fall of the Berlin Wall. Roughly a third (34%) of those surveyed cite that incident. Notably, 43% of East Germans, but only 32% of West Germans, name the collapse of the Iron Curtain as the most significant event. 2With the world war long behind them, and despite recent tensions over the Iraq War and U.S. National Security Agency spying on German Chancellor Angela Merkel, Americans and Germans view each other as staunch partners. A strong majority of Americans (72%) see Germany as a reliable ally, while 61% of Germans say the U.S. is a reliable ally. 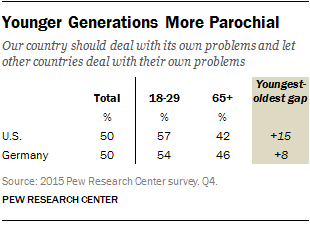 Older Americans (77%), in particular, have more faith in Germany than younger ones do (66%). Notably, 31% of Germans think the U.S. is not a reliable ally, compared with just 18% of Americans who do not see Germany as dependable. 3Half (50%) of both Germans and Americans say their country should deal with its own problems and let other countries deal with their own challenges. Roughly comparable proportions of Germans (43%) and Americans (39%) believe their nation should help other countries deal with their difficulties. Younger Germans and Americans in particular are more inward-looking than their older counterparts. More than half of Americans (57%) and Germans (54%) ages 18 to 29 hold the view that their country should deal with its own problems and let others deal with theirs. And only 36% of that age group in Germany and 31% in the U.S. believe that their country should assist other nations. This stands in sharp contrast with the attitudes of their older countrymen: 46% of both Americans and Germans ages 65 and older say their countries should do more to help others. 4Americans want Germany to take on more security responsibilities, but Germans aren’t interested. Asked if Germany should play a more active military role in helping to maintain peace and stability in the world, only 25% of Germans agree. Just over two-thirds (69%) believe that, given its history, Germany should limit its military role in world affairs. In contrast, 54% of Americans think Berlin should play a more active military role in maintaining peace and stability; only 37% say it should limit its role. German women (75%) are more likely than men (63%) to want to limit their country’s military activities, as are older Germans (90%) compared with their younger compatriots (58%). Older Americans (57%) and Democrats (60%) are the most likely to back a more active German military. 5Americans and Germans disagree about a U.S.-EU trade deal. Just 41% of Germans think a U.S.-European Union trade and investment agreement, called the Transatlantic Trade and Investment Partnership (TTIP), which is now under negotiation, would be good for Germany; 36% say it would be a bad idea. In contrast, half (50%) the American public backs TTIP, largely unchanged from 2014. And only about two-in-ten (21%) think it would be bad for the U.S.
German support for TTIP is down 14 percentage points since another Pew Research survey in February-March 2014. High-income Germans (43%) are more likely to hold the view that TTIP is a bad thing than are low-income Germans (32%). While about half (51%) of adherents to the Christian Democratic Union and the Christian Social Union, Germany’s conservative parties, think TTIP is a good thing, only 42% of members of the left-leaning Social Democratic Party support it. However, a significant portion of the German public is undecided: 23% volunteer they have not heard enough about the pact, think it is neither good nor bad, or simply voice no opinion. In the U.S., Democrats (59%) are more supportive than Republicans (45%). Nevertheless, as with Germans, much of the public is undecided. More than a quarter of Americans (28%) have not heard enough about the negotiation, think it is neither good nor bad, or simply have no view on the topic.